Craig Pollock endured one of those days no team owner wants last Sunday. For him, it was supposed to be a new dawn, but it turned out to be a day of disaster. 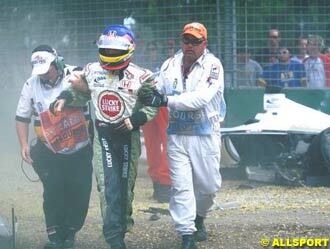 Not only did Jacques Villeneuve's race end in tragic circumstances with the death of a race marshal, who was hit by flying debris following his collision with Ralf Schumacher's BMW-Williams, but Olivier Panis was demoted from fourth to seventh when he was given a 25-seconds penalty by the race stewards for passing Nick Heidfeld under yellow flags. Of the two setbacks, there was no doubt which upset Pollock the most. The colour drained from his face as he saw his friend Villeneuve's car fly through the air, his BAR-Honda sending debris in all directions. The impact and its results were devastating. "When I first saw what had happened," Pollock recalled hours later, "I only thought of Jacques, because I did not see it clearly and I just hoped he was not hurt. It reminded me of 1982, when his father Gilles was killed when he ran into the back of Jochen Mass's car, which was going slowly in front of him. This was the same kind of accident and I really did not want to see it again. I did not know he was okay until I saw him riding off on the back of a scooter. 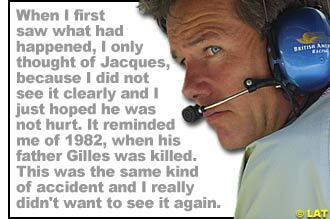 "I did not realise until after the race that anyone had been killed. When we saw the ambulance I just thought someone had been injured. Obviously, our thoughts are all with the official's family. We have no real idea how it happened. The safety standards relative to the cars, the monocoques, are so high now that I think the time has come for us to start to consider much more seriously the people who pay to come in and to watch the races. "Jacques has gone to hospital to be looked at and examined carefully. When he first got out of the car, the adrenalin was pumping and he was his normal self. But now he has settled down and the pain is settling in and he feels it. The realisation of what has happened has hit him too and he is very sorry for the official and his family." Villeneuve was released from hospital with a clean bill of health to spend Monday resting and, at the same time, busily trying to contact the family of Graham Beveridge, the 51-year-old man killed in the incident. That will have given Pollock some relief, but no consolation in his shock at realising that one of his British American Racing cars had been involved in a fatal accident at the season opening race, an event into which he had gone with such high hopes. Only a few hours before the race, this is what he told Atlas F1, when he was interviewed about his ambitions, achievements and workload during the winter past. "The minute the last race finished last year, I literally jumped in my car to go to the hotel, picked up my bags and got on a plane and I was in the office on Monday morning at 8:00am. The first flight out. And I had one objective which was to start the 2001 season so there was no let up but to start in such a way that we could bring stability into the company and get rid of all reasons for rumours. Internally, we were all fed up with it, with the in-fights and perceived internal in-fights. I think that was the first thing I had to concentrate on so that is what I did. "It took a fair amount of time, and at the same time the team were given a mandate to strengthen up in certain key areas. We started in aerodynamics because that is where you get performance and also on the engineering side where I think we were not weak but we weren't just there. "The people were good, but we needed to strengthen that area. So we looked hard and did just that. Again, all through the winter we decided that we would bring the car out a lot later than the previous year but we were probably out as one of the earliest of all the cars. I think we were the first 2001 car to run, beating Jaguar by about an hour. "We launched the car one day and ran the next day, which surprised us tremendously because we had aimed at increasing our performance and finding that fine balance between performance and reliability. In the winter, we just ran and ran and ran and literally nothing was breaking just right out of the design office. "So we knew we had got the reliability and maybe we have made a little bit of a mistake in finding too much reliability and not enough performance. So, these are the main things from the winter. A clear decision was made by the whole company that we did not want to have any more speaking of fighting internally. That happened. It is totally finished and so far as the press is concerned everyone is refusing to go along with it. We are not interested in it. Not interested in what the outsiders are thinking. We are only interested in ourselves." The talk of internal disagreements was something Pollock would care to forget. He insisted on numerous occasions that talk of in-fighting was way off the mark and at the team's launch in London he stamped his foot down on the speculation by refusing to talk about the situation. The fact there was nothing to say from Pollock's point of view said it all, nothing had gone on. However, BAR Holdings, of which Pollock is a key player on the board, introduced a new face as non-executive chairman with Ken Clarke, a former chancellor of the exchequer with the British government installed at the helm. Pollock is in no doubt that the appointment is a positive move for the Brackley-based entity. "Obviously in doing that we decided to strengthen our holdings board by bringing in some heavy hitters who can help us for business in the future," he said. "So we have changed the chairman of the holdings board which is a non-executive position by bringing in Ken Clarke. For me, that is extremely positive because we know that if we want to get to people we can get all the way there. "To get the top head of a government and so far as Formula One is concerned at the moment that is a very positive addition because there are going to be so many changes. At the same time, I have been trying to follow all the changes in the sport and to understand where Bernie (Ecclestone) with SLEC is going and with EM.TV and Kirch and so on and all the various deals. That has not been easy because it is as clear as muddy water to my mind. It is all coming to a head now, I think. "The structure here is exactly the same as it was. Holding a board made up of non-executive directors of the company means they have nothing to do with the day-to-day running of the company and the holdings board goes down to an operational board. I am chairman of the operating board. The chairman of the holdings board is there as an arbitrator, if you like, should we get into a deadlock between shareholders when decisions are taken. No changes have been made. We've just strengthened and have the same structure as previously. "All the share holdings remain the same and nothing has been changed in this area and nothing has been sold. That is the other thing we have been very fed up with - all the rumours about wanting to sell to somebody and someone wanting to buy. 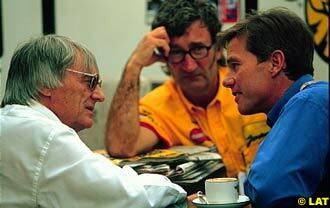 Formula One is a very attractive business and a lot of people want into Formula One. So the rumours start, but there is nothing there. Nothing at all. "The day-to-day operational side of things includes the technical director, a chief operating officer, a financial officer, we have a production director and they are the key people. We have six people really and we try and do everything with consensus of opinion not as a dictatorship and we have never had gridlock. We never had to use the chairman and use a casting vote. Decisions are made basically through logic and discussion. We've never really had any heated discussions in any of the board meetings so it actually does work." Pollock's troubles in his attempts to develop BAR as a potential force in Formula One have been well documented. The opening season in 1999 was a disaster, while progress was undoubtedly made last year as the team ended fifth in the constructors' championship. But Pollock feared the hard work of the first two seasons in the sport would be thrown away when he learned that engine supplier Honda would also link up with Jordan for the 2001 season. That fact that Jordan had 10 years experience behind them, Pollock felt, would count against BAR and he was convinced his team would suffer. The truth is yet to be discovered, but if Australia is anything to go by, the BAR-Jordan shoot-out could make interesting viewing this year. "We first learned about the Honda deal with Jordan literally at the same time as the press began writing about it," Pollock added. "First reaction was anger - personally, not team wise - and disappointment, because of Honda's need in our mind to cover their back. They were hedging their bets by taking a second team and taking Jordan as the more experienced team. They had made their own decision to come in on their own team and gone back on that decision and decided to come in with someone else. We were obviously a totally inexperienced team building up a relationship with them and they obviously felt we were not delivering results fast enough for them so they thought, maybe we were not able to do it, so they brought in a second team. But we got over it quickly. "We are still for Honda their chassis development team and they have a lot of engineers in our facility and if anything, I would say our relationship with Honda has strengthened rather than weakened. They are good people, but the strengthening of it has come from the fact that the people who are with British American Racing are not necessarily the people who made the decision to go with Jordan. "So the people here at the track for Honda are very fair and I would say our relationship with the Honda people is stronger than the Jordan relationship with Honda. It doesn't mean to say it won't change as Eddie (Jordan) has his own way of doing things. But they are far more used to working with a more corporate style than a small business style and we are a more corporate company than a small business... so there it is." Pollock knows that the rivalry with Jordan could damage the development of BAR and he promised that his sights, and those of everybody involved in the team, will be set higher than bettering Jordan. Pollock wants to close the gap on Ferrari and McLaren, and look beyond their mid-field rivals. "I think it is good for us, because now we have an absolute benchmark," Pollock says. 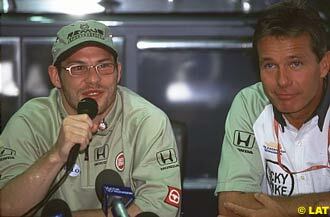 "Jordan have got two good drivers, the same engines and the same tyres. The only difference is the chassis and that means that here at the start of the season their chassis is working a little better than our chassis and they are a bit faster than us and we have to work harder. So that means reality check. We have a clear goal and we know we must aim at Ferrari and McLaren, not just Jordan, but it helps to have a rival and an obvious step to aim at."